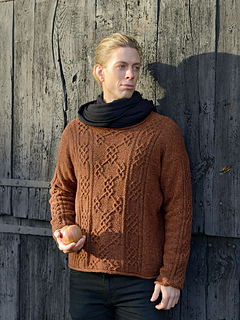 A spectacular pattern on a simple sweater; two Viking Knits panels, a wider one centered front and back, framed by a narrow panel that is also used on the sleevesand narrow rolled edges at the bottom, sleeves and neck. A clear case of the result being more than the sum of its parts. You can lengthen the garment in increments of a half repeat if you so desire. Cable patterns are charted only. 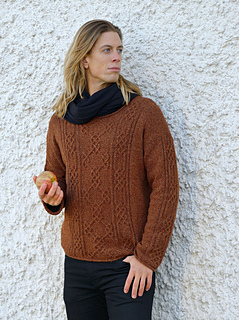 Length 26½ in / 67 cm.